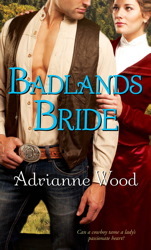 Those of you who also follow us on Twitter may have seen that recently I participated in a chat with author Adrianne Wood, whose western romance, BADLANDS BRIDE, is out now. It was a great chat, and we talked a lot about the self-publishing phenomenon, because Adrianne first published BADLANDS BRIDE as a Nook exclusive, and quickly became a bestselling e-book there. If you missed the chat, or aren’t a Twitter-person, you can read the entire exchange here: http://storify.com/colleenlindsay/pathtopub-moving-between-self-and-traditional-pub. Are any of you considering self-publishing (or doing it)? Do you read self-published romances? What do you think about this new element of e-books? Fans of western romance know that in recent years, it hasn't always been easy to find this subgenre on the shelves. Adrienne Wood originally published BADLANDS BRIDE in e herself, where it became a Nook bestseller. With a plucky fossil hunter facing off against a frontier journalist, it's not hard to see why!